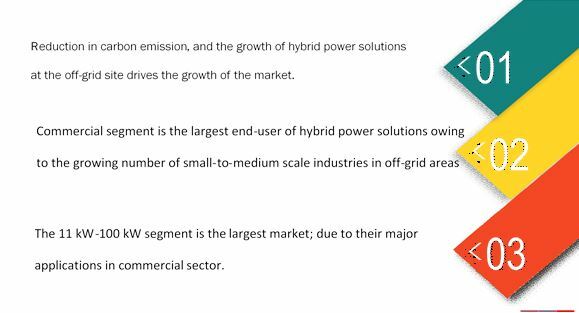 [131 Pages Report] The global hybrid power solutions market was valued at USD 432.0 million in 2015, and is expected to grow from USD 466.5 million in 2016 to USD 689.5 million, at a CAGR of 8.13% from 2016 to 2021. Hybrid power solutions are emerging power supply source, and are suited for off grid or bad grid areas, isolated grids and islands where power supply through grid is not economical and viable option. Hybrid power solutions combine renewable power sources (wind and solar) along with diesel generators for efficient and reliable power supply. These hybrid power solutions find its applications in the residential, commercial, telecommunication, mining, and oil & gas sectors among others. The base year considered for the study is 2015, and the forecast has been provided for the period between 2016 and 2021. Off grid sites are those sites where electricity access is not available through grid connection. Off gird sites may be telecom towers, industrial units and small villages, which are located in remote areas and do not have grid connectivity. Laying down grid network in these regions for 100% electrification requires huge investment. The growing power demand can be met through deploying hybrid power solutions designed according to individual power requirement of residential and non-residential customers. Hybrid power solutions combine diesel generator along with renewable sources (wind, solar or both). It ensures 24*7 power supply to off grid sites with less interruption. 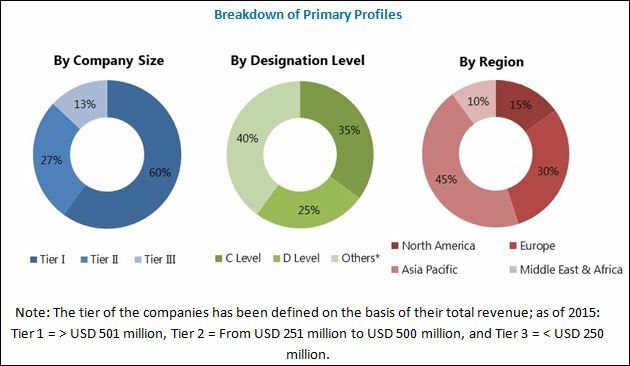 During this research study, major players operating in the hybrid power solutions market in various regions have been identified, and their offerings, regional presence, and distribution channels have been analyzed through in-depth discussions. Top-down and bottom-up approaches have been used to determine the overall market size. Sizes of the other individual markets have been estimated using the percentage splits obtained through secondary sources such as Hoovers, Bloomberg BusinessWeek, and Factiva, along with primary respondents. The entire procedure includes the study of the annual and financial reports of the top market players and extensive interviews with industry experts such as CEOs, VPs, directors, and marketing executives for key insights (both qualitative and quantitative) pertaining to the market. The figure below shows the breakdown of the primaries on the basis of the company type, designation, and region considered during the research study. Key players considered in the analysis of the hybrid power solutions market are SMA Solar Technology AG (Germany), Siemens AG (Germany), Huawei Technologies Co., LTD (China), ZTE Corporation (China), Flexenclosure AB, LTD (Sweden), and Heliocentris Energy Solutions AG (Germany), among others. In November 2016, Flexenclosure launched maintenance free hybrid power system eSite x10 for telecom industry. In December 2015, Electro Power Systems acquired Elvi Energy (Italy) to become market leader in integrated storage system. In October 2015, SMA America partnered with Farm from a Box to develop an off-grid toolkit for food production. Toolkit comprised 10 high-efficiency solar modules, an SMA Sunny Island 6048-US off-grid inverter, SMA Sunny Boy 3000TL-US inverter with Secure Power Supply, SMA Sunny Web Box remote monitoring solution, SMA Smart former transformer and distribution box, and deep-cycle batteries for energy storage. The array is supported by a 3,000-watt generator. What are new application areas which the hybrid power solutions companies are exploring? The global hybrid power solutions market is projected to grow at a CAGR of 8.13% from 2016 to 2021, to reach a market size of USD 689.5 million by 2021. The growth is attributed to growth in hybrid power generation in off-grid sites, reliable power generation with minimized fuel, and reduced operation and maintenance cost, and reduction in carbon emission. Hybrid Power Solutions: Hybrid power solutions means combining two power generation sources together to reliable power supply. Hybrid power solutions combine renewable sources like wind and solar photovoltaic with engines or generators run by diesel fuel. Hybrid power solutions minimize diesel operating cost and carbon emission by reducing diesel generators run time. Hybrid power solutions are suitable for off grid or remote areas, isolated grids and islands where power supply through grid is not economical and viable option. The report segments the hybrid power solutions market based on end-users into residential, commercial, telecom, and others. Commercial segment is the largest end-user of hybrid power solutions owing to the growing number of small-to-medium scale industries in off-grid areas. The report segments the hybrid power solutions market based on system type into solar-diesel, wind-diesel, solar-wind-diesel, and others. Solar-diesel segment is estimated to be the largest market owing to rising awareness and installation solar power systems across the globe, especially in developing countries. The market has also been segmented based on power rating into three sub-segments: upto 10 kW, 11 kW­-100 kW, and above 100 kW. The 11 kW-100 kW segment is the largest market; due to their major applications in commercial sector, where these systems offer more design flexibility and provide reliable power in comparison with traditional diesel based power generation solutions. In this report, the hybrid power solutions market has been analyzed with respect to four regions, namely, the Americas, Europe, Asia-Pacific, and the Middle East & Africa. The Middle East & Africa is expected to dominate the global hybrid power solutions market during the forecast period, owing to government initiatives towards rural electrification and power generation through renewable sources. The region is expected to be the fastest growing market among other regions, during the forecast period. In developing countries, a large number of population live in remote or off grid areas. Installation and distribution costs are considerably higher for remote areas. Laying down grid network in these regions for 100% electrification requires huge investment. One of the primary needs for social and economic development of any country is efficient and regular power supply to its residents. Hybrid power solutions combine diesel generator along with renewable sources (wind, solar or both). It ensures 24*7 power supply to off grid sites with less interruption. Thus, the public authorities can achieve 100% electrification by deploying hybrid power solutions in remote or off grid areas. 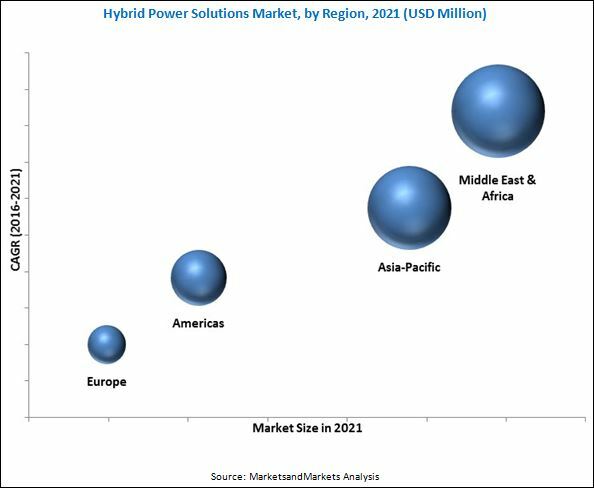 Hybrid power solutions market has been segmented based on end-users into residential, commercial, telecom, and others. Telecommunication is one of major industry in terms of electricity consumption. Today energy saving is a key sustainability focus for telecom industry. This implies, especially, in rural areas where electricity consumption contributes up to 70% of total network operating cost. With increasing number of mobile subscribers, the electricity consumption by telecom sector is set to increase in the next five years. To provide network coverage, telecom companies are setting telecom towers in remote areas where grid connection is not available to provide mobile access to their customers. The setting up of towers at off grid areas, are driving growth of hybrid power solutions in telecommunication industry. Commercial sector includes hotels, resorts, schools, or hospitals which are located at islands or off grid areas. These islands do not have grid power supply and highly dependent on diesel generators for their power requirements. Dependence on diesel adds huge operating cost in their annual expenditure. These concern factors create huge opportunity for implementing hybrid power solutions in commercial sector. Residential sector is one of the key users of hybrid power solutions. Electricity production cost is very high in islands areas due to high price of fuel. Integration of renewable power sources with diesel generators provides reliable and cleaner power by reducing carbon emissions. Further, the less availability of land space for gird infrastructure drives the hybrid power solutions at the residential sector. What are the upcoming industry applications for hybrid power solutions? The higher initial investment for hybrid power solutions is a major factor restraining the growth of the market. Initial cost is very important factor to be considered before deciding power system. With limitation of fund availability, it may not be possible to include renewable generator even if all factors are in favor of hybrid power system. For minimizing the required initial investment, power generation through non-conventional sources should be promoted. Key players in the market include SMA Solar Technology AG (Germany), Siemens AG (Germany), Huawei Technologies Co., LTD (China), ZTE Corporation (China), Flexenclosure AB, LTD (Sweden), and Heliocentris Energy Solutions AG (Germany), among others.. These players are increasingly undertaking contracts & agreements, partnerships, joint ventures, and collaborations, mergers and acquisitions, and product launches to develop and introduce new technologies and products in the market. 11.5 Huawei Technologies Co. Ltd.
11.14 Electro Power Systems S.A.